Police in East Lothian are appealing for information to help trace a man reported missing on Saturday 18th June. 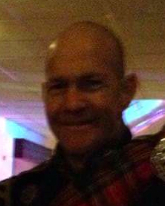 James Boyd was last seen around 8.30pm in St Andrew Street, Dalkeith. Since then the 48-year-old has not been in touch with friends or family and officers are concerned for his welfare. James is described as being 5ft 8in tall, of slim build with brown/hazel eyes and brown short shaved hair. He is wearing a grey/brown zipped cardigan, blue jumper and blue work trousers. James is known to frequent the Dalkeith and Longniddry area. Police Inspector Andy Hill of Haddington police station said: “We are growing increasingly concerned for James as he is not in the best of health and we would like to make sure he is safe and well.